Buying a light bulb is a little more complicated than it used to be. 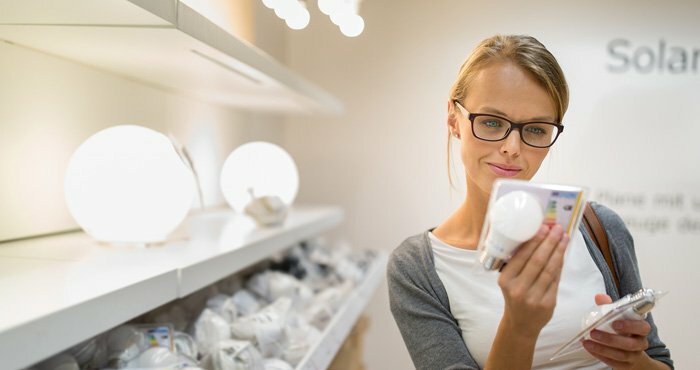 You can't just pick up a similar watt bulb and expect it will match the other bulbs in the room, or even work in your fixture. So before you purchase your next bulb, you should arm yourself with these five facts. Light bulbs come in a variety of sizes and shapes, depending on where you're using them. The standard light bulb used in U.S. households is an A19 bulb with E26 base. The E means that the bulb has an Edison Screw and the 26 means the base is 26mm across (in Europe you'll find E27 bulbs). The A refers to the bulb shape. A is for arbitrary and is the shape that we all think of when we envision a light bulb (C is for candle, G is for Globe etc.) The number 19 designates the size. Bulbs.com has a great light bulb shape chart for reference. The site also has a handy light bulb base chart. The fixtures in your home will have a rating for the maximum watts they are capable of safely handling. If you buy an energy-saving bulb and want a brighter light, you can buy a bulb that delivers more lumens and still stay safely within the maximum wattage allowed. For instance, a 9-watt LED bulb delivers the same amount of light as a 60-watt incandescent bulb. So you could safely move up to a 15-watt LED bulb, which would deliver the same amount of light as a 100-watt incandescent bulb. Smart LED lights can change their color across the spectrum of white light (and some can produce a wide range of colors as well). These may be of interest as different color variants may work better for specific tasks—for example, you might want a bright blue-tinged white light in the morning or for better contrast while reading but enjoy a warmer light. at bedtime. Blue light has been shown to interfere with sleep, which is another advantage of being able to adjust your lights to warmer tones at night. Not all light bulbs can be dimmed or used in 3-way fixtures, especially compact fluorescent and LED bulbs. The packaging should specifically say that the bulb is "dimmable" or "3-way" in order for you to know that the bulb will indeed work with your dimmer or 3-way fixture. When you're buying new bulbs—no matter the type—you'll want to look for the Energy Star label. Energy Star certified light bulbs are tested to meet energy efficiency standards and will include labeling to tell you exactly what you're buying. The Energy Star label will show the bulb's brightness (in lumens), color (i.e. color temperature), lifespan, energy usage, and what it will cost to run it for a year. This information makes it easy to compare bulbs, especially if you're considering bulbs of different types. Energy-saving incandescents (halogen): These lower wattage incandescent bulbs have a tungsten filament like standard bulbs, but are surrounded by a halogen gas, rather than argon or nitrogen, which provides bright light with better efficiency. These are 25% more efficient than traditional incandescent bulbs and will last three times as long. Prices start at just under $2 per bulb (620 lumens). Compact fluorescents (CFLs): You've probably seen—and maybe hated—these curly, bulb-sized fluorescents. Though early versions tended to offer harsh light, the latest CFL bulbs have more color options and some are even styled to look like traditional incandescent bulbs. These bulbs offer 75% energy savings over an incandescent and last ten times as long. Prices start under $3 per bulb (1600 lumens). LEDs: The most efficient option, LED bulbs are 75-80% more efficient than traditional incandescents and last 25 times longer. Prices start at just under $2 per bulb (800 lumens). Smart bulbs: Smart bulbs are LED bulbs that can connect to Wi-Fi so you can control them from your computer or a smartphone app. While the functionality is a bit different for each bulb, you can typically tell them to turn on or off at different times and turn them on or off from afar. Some bulbs will even have the option to control the light color. Prices start at just under $15 per bulb (800 lumens). Updated on 9/7/2018 with new tips, products and pricing. I didn’t know that LED lights are able to last 25 times longer than other bulbs. My wife just bought a new lamp and we have no idea what type of lightbulbs to use. It would be nice to try LEDs because then we wouldn’t have to replace them as often. Good article- do you know where I can find how led lights effect the color of paint. We built our home 11 years ago. All the bulbs in the house are commercial grade 130 v filament. I’m still using bulbs we put in at finish of build. I can’t get a led to las more than 2 years much less 25 years. I had saved my boxes with receipts so I could return but now I seemed to have misplaced them. So my question is ??? Which led really last years! Some of my incandescent bulbs have never quit in 11 years! So what’s the point of paying more for abukb if you have to buy another high dollar bulb in a year or less! I might be using less electricity but spending double on bulbs ! Could be the brand of bulb or your setup? 2) LED bulbs don’t do well with heat, so use in enclosed fixtures or recessed cans (unless they’re specifically designed for that) can cause early burnout. 3) Dimmers that aren’t rated for LED bulbs may be causing power issues that are leading to early failure of the LED bulbs. Given your house is 11 years old, I wouldn’t be surprised if the dimmers are not LED-rated. 4) Electric surges in your system may affect the more delicate LED circuitry than your incandescents. 5) Fluorescent lights on the same circuit can damage LED lights due to the voltage surge when switching them on or off, or flashing each time they start up. I would at these factors and see if they might apply to your situation. Or consult an electrician who ca give you a more precise answer.